Transaction of Today…August 30, 1996 – To complete an earlier trade on August 28, 1996, Jason Schmidt is named the player to be named later, joining Ron Wright and Corey Painter in going to the Pittsburgh Pirates for Denny Neagle. The Braves went for it all in an effort to repeat as champions. It didn’t really work out as planned, but fortunately for them, it went even worse for the team they traded with. A year after beating the Cleveland Indians in the ’95 Series, Atlanta was once again the elite team in the National League. The Big Three of John Smoltz, Greg Maddux, and Tom Glavine continued to dominate with Smoltz pitching himself to a Cy Young award. However, the rotation was beginning to show cracks. The 26-year-old Steve Avery was a pending free agent whose rapid decline was only continuing as his strikeout rate plummeted and his effectiveness waned. The Braves had promoted Schmidt into the fifth role, but by mid-July, the team demoted him to Richmond due to a 6.75 ERA. With Schmidt demoted and Avery struggling to stay healthy, the Big Three were joined by Brad Woodall, Mike Bielecki, and Terrell Wade in the rotation – hardly the level of talent Atlanta was happy providing depth to their rotation. Atlanta grew anxious and anxious teams make moves. 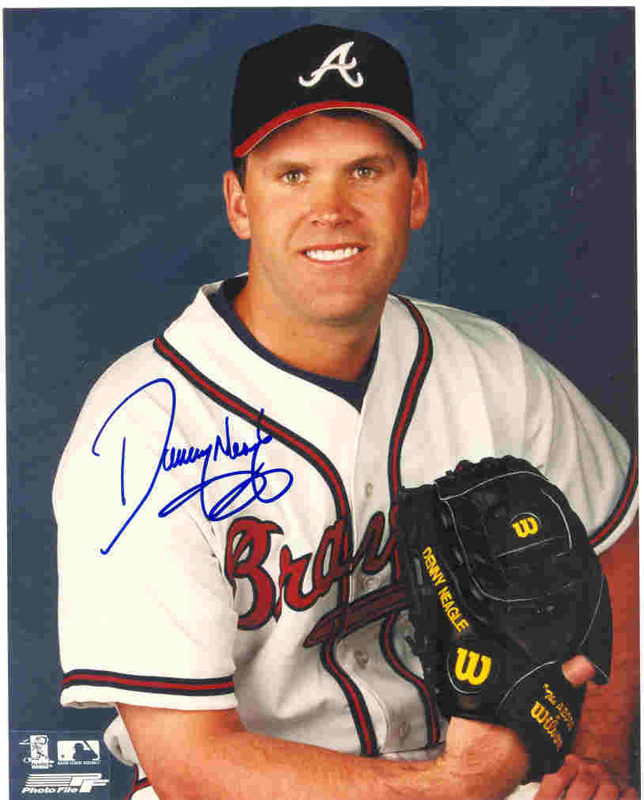 On August 28, the Braves finished the legwork on a trade to acquire Denny Neagle from the Pirates. In the trade was catcher/outfielder Corey Painter and first baseman, Ron Wright. There was also a player to be named later and it didn’t take too long for that player to have a name. Jason Schmidt. Let’s talk about the bounty the Braves surrendered first with far too many words. Painter was another in the long line of toolsy prep bats the Braves preferred back in the 90’s. Picked out of Waxahachie High School just outside of Dallas, the Braves made Painter the #46th overall selection of the ’94 draft. It remains the highest selected draft pick out of that high school which has yet to produce a major leaguer. That might be a spoiler alert about Painter’s career. Painter had good power and bashed 15 homers before the trade – mostly with Eugene of the Short-Season A Northwest League. He also had plus athleticism, which is why the Braves were giving up on the idea of Painter being a catcher. However, he struck out a ton and that was against pitchers who didn’t have developed breaking pitches. After the trade, Painter languished for three years in A-ball. Finally, in 2000, he was pushed up to Double-A, but after 50 PA, the Pirates’ patience was exhausted. His career was over at the age of 24. Ron Wright seemed so much bigger than his listed height of 6’1″. Perhaps that’s due to his impressive power. A year after picking him in the seventh round of the ’94 draft, Wright pushed his way onto the Macon roster and bashed 32 home runs over 594 PA as a 19-year-old in the South Atlantic League. He showed good plate recognition to boot just in case the power wasn’t enough to make him an intriguing prospect. Wright hit mammoth home runs, including one measured at 515 feet at the old Luther Williams Park. He moved up to Durham the next year and was a Carolina League All-Star on a packed Bulls ballclub that also featured Andruw Jones. Wright didn’t journey from A-ball to the majors like Jones did but did earn a promotion to Double-A at midseason. Over 129 games split fairly evenly between Durham and Greenville, Wright hit 36 home runs. He was a legit prospect and would be ranked as such in the 1997 preseason Baseball America Top 100 when he was named the #48th best prospect in baseball. However, Wright’s prospect status would take some bad turns. He was good in an injury-shortened ’97 campaign that earned a promotion to the majors. Unfortunately, he didn’t play that September because of a sore wrist and that was the first of a few harsh injuries that would derail the young kid. He played less than 50 games the next two seasons as a back injury required almost immediate surgery to remove a disc. Unfortunately, complications from that surgery would also sideline him as his sciatic nerve had been inadvertently clipped. Even to this day, his right leg continues to feel numb. Wright began to journey through the league, playing for the Reds, Rays, Mariners, Indians, and Tigers organizations. He continued to hit, but his power numbers were never quite as impressive as they were before his trade to the Pirates. While with the Mariners, he did receive a promotion in mid-April to the bigs and started one game at first base. It was one of those games you’d hear about if they made a sequel to Field of Dreams. Kenny Rogers of the Rangers got him looking in the second as he struck out. With the Mariners up 1-0 in the fourth, Wright stepped in after Ruben Sierra had doubled and John Olerud had singled. Wright hit the ball back to the mound and Rogers started a possible double play. However, Sierra decided he’d try to steal a run and came home. Alex Rodriguez, who caught the ball from Rogers, forced Olerud at second before firing home to get Sierra after a brief rundown. While that rundown was happening, Wright was prompted to go to second base. A slow runner even before the back troubles, Wright was dead meat after Sierra was eventually tagged out. If you were scoring at home, it went 1-6-2-5-1-4. A triple play. Wright’s third at-bat came in the sixth. Again, Sierra and Olerud began the inning with hits – both singles. Wright hit the daylights out of the ball, but it was on the ground for a 6-4-3 double play. In the 7th, the Mariners staged a six-run rally to take the lead 7-5. Wright was pinch-hit for. After the game, Bret Boone gave Wright the lineup card – when he still has – and Alex Rodriguez even signed it. Wright was on the roster for one more game with the Mariners, but he didn’t play and was demoted to the minors. It was Wright’s final day in the majors. He later went to the Idaho State College of Pharmacy for his post-baseball career. And then, there was Schmidt. Painter was a wild card and Wright was a rising prospect, but Schmidt was the can’t miss guy. Capable of throwing a heavy fastball with life along with plus secondary pitches, Schmidt was already one of the game’s most promising prospects. While he struggled mightily with the Braves in ’96, his quick rise from an ’91 8th-rounder to a blue chip prospect was no fluke. He had the stuff to back it up and the Braves liked him a lot. However, they liked winning more and wanted to continue to build to their brand as the Team of the 90’s. After the trade, Schmidt would pitch for Pittsburgh from ’96 to ’01. He was never the guy they had expected him to be, though the Pirates were a mess in the late 90’s. The righty was still pretty young at 28 and closing in on free agency in 2001 when the Pirates traded Schmidt to the Giants. In San Francisco, Schmidt would turn his career around and became the ace the Braves foresaw him being when they were developing him in the minors. In five full seasons with the Giants, Schmidt was named to three All-Star teams and was the ’03 Cy Young runner-up. He landed a mega deal with the Dodgers after ’06 but pitched just 10 times while making over $45M. Painter, Wright, and Schmidt was the price tag, but was Neagle worth it? You better believe he was. Neagle, who had once been traded for former Pirate standout John Smiley, had joined the rotation in ’94 and was an All-Star the year after. He was a workhorse with a good curveball and an excellent changeup. And, perhaps most importantly, he was better than the 1996 version of Avery. He would finish 8th that season in the Cy Young Award voting and was solid for the Braves over four postseason outings – including two starts – in the NLCS and World Series, though he didn’t factor in a decision. Neagle’s best year with the Braves was 1997. That season, the Big Three+Neagle each had an ERA under 3.03, each started 33 games, and each threw 230+ innings. The ’97 Braves didn’t have a fifth starter (well, they had four, but none of them stuck) and frankly, they didn’t need one. Neagle would pitch twice against the Marlins in the Erik Gregg NLCS. Notably, he threw a shutout in Game 4 with seven strikeouts. 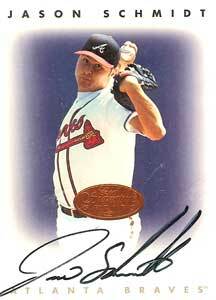 In 1998, Neagle was part of a Braves rotation that had five pitchers win 16 or more games. However, that was a double-edged sword for Neagle, who was the least effective of the five and with Kevin Millwood now an unquestioned member of the staff, Neagle’s pricey salary was considered a luxury the Braves could do without. After that season, they packaged Rob Bell (read more) and Michael Tucker with Neagle for Mike Remlinger and the aforementioned Bret Boone. After just a year-and-a-half with the Reds, Neagle was moved to the Yankees where he won a ring after the Subway Series that fall. A free agent after 2000, Negale landed a big money deal with the Rockies. He earned $25M over three years in which his ERA was 5.57. That’s good work if you can find it. The Rockies actually owed him at least an additional $19M, but cut the pitcher following allegations of soliciting a prostitute. Citing a morals clause in his contract, the Rockies simply voided the rest of his deal rather than pay him. Neagle, who was married with a four-year old, avoided jail time, but not a divorce. Neagle tried a comeback in ’05 with the Rays, but never pitched for them because of injury. He would later be cited for a DUI and was part of the Mitchell Report as a steroid-user. Well, this story got negative real quick. Let’s circle back. Twenty years ago, the Braves sent a promising pitcher to the Pirates to finalize a trade for an established lefthander at the height of his career. The deal didn’t bring another ring, but Schmidt never helped the Pirates halt the string of losing seasons, either. Ultimately, it was a winner for the Braves. Still, you have to feel for Wright. One game and you’re “responsible” for six outs in three at-bats. Yikes.